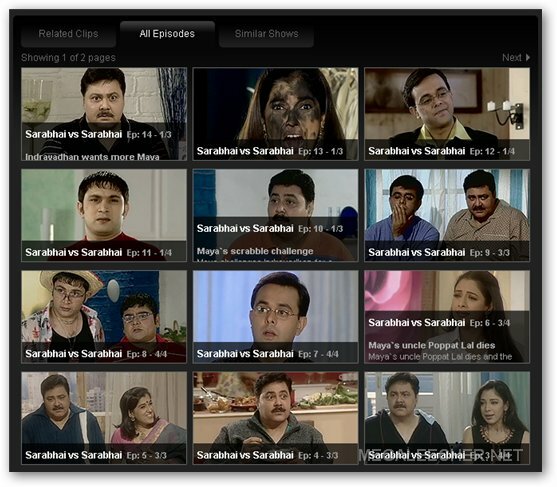 India's leading television channel group Star TV has now launched their official website to access videos of their shows from Star Plus, Star World, Star One, Channel [V] And Star News TV channels via internet, the site currently features few episodes but the company plans to upload its video archives on the website in future. The website makes use of Star Player (a Adobe Flash based player) and is monetized by in-video advertising, the company also plans to make this platform available to other broadcasters and is currently in talks with three TV channels. How to view this channel for user outside India?.Can you help me,Admin? Is this site blocked outside india ?? If yes then you can access it from an indian proxy. i need some basic information about starone.can any 1 help me? Coterie in 'music ka mahamokabola"
Well, I have been following the singing competition in the ' Music ka Mahamukabola '. somewhere I have the feeling that there is a coterie at the top who sketch things in such a way that new talent does not come up. This is done with an eye to protect their place eternally, by people who are already there. This I am not saying meaning that those people are being selected through this illdesigmed competition are incompetent people. My point is that if the remote control from the competition is taken off somebody else with talent may come out for the proposition. A portion of the audience and the TV viewers started perceiving that already. It will be the onus on the part of sponsors to correct the wrong doing which is going on uninterrupted so that newer and newer talent find their scope to go up. Please reply to my letter, you may ignore it but the public at large started already sensing it. If you sponsor an unholy design you will only attract outrage from the people, this might go against your business interest. Are you listening? Why have you replaced Neha from Dhani's role in Sajan Ghar Jana Hai? Neha was the soul of this role. Barkha is no match. Barkha looks like an older sister to Amber. I and my organization of several hundered people in Los Angles, USA will only return to watch this show if you show respect to our intelligence by bringing Neha back. i can tell u sajan ghar jana hai this show is baddest........................ show in the world. acting is vvvvvvvpoor.i love to see sassural genda phool. Even if i don't live in india ?? Please someone tell me !??! Wow, usually very good to determine. I actually appreciate the time it must have taken to set together this great site. Thanks for sharing great stuff! star one , we are the regular watcher of your channel. miley jub hum tum is my fav serial ,but it is now end. so i want to request u that please cast mohit sehgal and sanaya (sajan) in some another show bcos we realy miss them so much and we just want to see both of them dealy. please star come with the season3 of miley jub hum tum , the new sirial telecast on star one on 9 pm slot is realy very boring . we all miss the caracters in miley jub hum tum very much.....so plzzzzzzz take our request on grant and start the new session of miley jub hum tum with the same star cast i.e. mohit , sanaya,arjun, rati etc. This Website and Player Is Not Worked For Outsiders.